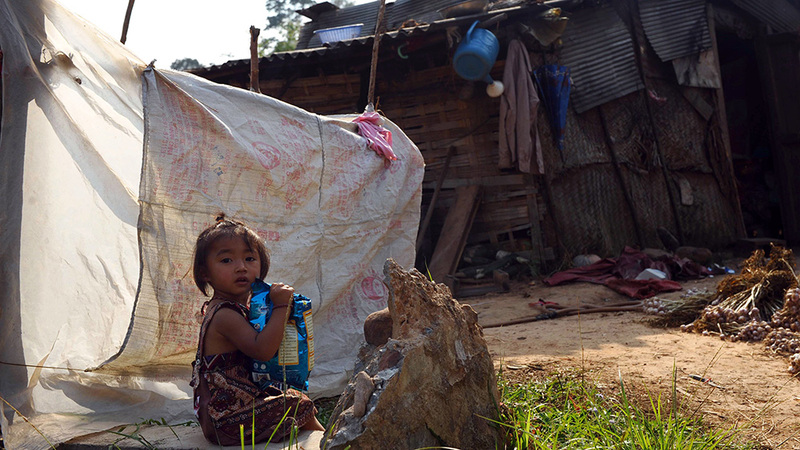 A young girl holds a bag of snacks in front of her home at a village in northern Laos' Luang Namtha province, in a file photo. “For all the talk about poverty reduction, the Lao government has failed to listen to the voices of those who live in poverty,” said FIDH Secretary-General Debbie Stothard. Alston will conduct an official visit to Laos from March 18-28, focusing on the links between poverty and the realization of human rights, before presenting a detailed statement of his initial findings and submitting a final report to the U.N. Human Rights Council in Geneva, Switzerland. In their joint submission to Alston, FIDH and LMHR detailed several human rights violations they said disproportionately affect those living in poverty, and exclude them from participating in political processes and from seeking redress for rights violations. Among the violations the two groups listed are restrictions on participating in public affairs, curbs on freedom of association impacting civil society, a lack of due process and the ability to seek justice for rights violations, repression of the right to freedom of expression limiting people’s participation, and the exclusion of communities from the decision-making process for infrastructure and investment projects. Such rights are guaranteed by international instruments, such as the International Covenant on Civil and Political Rights (ICCPR) and the International Covenant on Economic, Social and Cultural Rights (ICESCR), to which Laos is a state party, the groups note. LMHR President Vanida Thephsouvanh specifically highlighted how major development negatively impacts those living in poverty when they are left out of the decision-making process. “Infrastructure and investment projects have disproportionately affected poor individuals and communities in Laos but such projects continue to be designed and implemented without their adequate participation,” Vanida said. “A new rights-based approach to participation is urgently needed in order to ensure that those living in poverty can make their voices heard,” she said. Andrea Giorgetta, FIDH’s Asia Desk director, echoed Vanida’s concerns in an interview with RFA’s Lao Service. “[For] those living in poverty … we’re receiving the information that communities are in most cases not consulted about the project,” he said. Laos has for decades played host to U.N. agencies working on development and combating poverty in the least-developed nation. But it is unusual for the communist government to engage with the world body on sensitive issues linked to human rights. In 2017, it permitted a visit by the U.N. Special Rapporteur on the sale and sexual exploitation of children, Maud de Boer-Buquicchio, who concluded that Laos had made good progress on child protection but needed to do more to tackle problems including child trafficking, forced marriage, prostitution, online sexual abuse, and sexual exploitation by tourists. De Boer-Buquicchio’s visit marked the first by a U.N. independent expert to Laos since 2008. What about the humanright violation in Laos. The constant use of military to attack the hmong people hiding in the jungle of Xaisombou from May 1975 till now Febraury 2019. In 1975 about 30,000 hmong rebels and their family hiding and fighting the Lao PDR. Now 2019 their is an Estimate of less then 800 hmong rebels left in the jungle. The United nation need to help them and listen to their cry for help. It has been 40 years and noting is being done about it. The UN need to tell the Red Laos and Vietnamese to stop attacking them. The country of laos is corrupt and poor because vietnam control laos. They took all resource from the country of Laos. What about the humanright violation in Laos. The constant use of military to attack the hmong people hiding in the jungle of Xaisombou from May 1975 till now Febraury 2019. In 1975 about 30,000 hmong rebels and their family hiding and fighting the Lao PDR. Now 2019 their is an Estimate of less then 800 hmong rebels left in the jungle. The United nation need to help them and listen to their cry for help. It has been 40 years and noting is being done about it. The UN need to tell the Red Laos and Vietnamese dog eater to stop attacking them. The country of laos is corrupt and poor because vietnam control laos. They took all resource from the country of Laos. All Laotion must took arms and kick these vietnamese dog out. It's a wonderful dream to help the poors in Laos to just get by, if they can. When dream is over in the light of the next morning, it's hell that steps in and those poor souls will continue to be exploited by the rat, blood-sucking Lao party-state in the same old way on and on. The problem is COMMUNIST VIETNAM doesn't want LAO PEOPLE to participate in Laos affair Except their PEPPETS. Vietnamese and Lao are brothers. Your leaders are all at least half Vietnamese or even more or married to Vietnamese. Please don't try to break the good relationship between our two countries. We will walk hand in hand toward a brighter tomorrow. Long live Lao-Viet Union !